Vrijburcht is a multipurpose living-and-working complex in Amsterdam. It offers many shared social amenities for both the residents and the people from the neighbourhood. 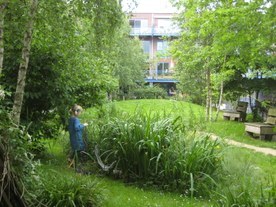 The heart of the complex is the courtyard garden with trees, a vegetable garden, lawns, flowers, benches and a greenhouse. The garden provides various solutions to the expected impact of climate change; it offers residents a cool environment during warmer summers; rain water is stored in underground tanks for irrigation in dry periods; the unsealed area permits maximum rainwater permeability. The complex was realized and financed through of a ‘collective private commissioning’. Future residents jointly develop the project, which gives them maximum influence on the design but also includes carrying the risks related to the pre-financing and construction phase. The climate-proof courtyard garden was an integral part of the design of the complex and its features based on the wishes of the future residents. Climate change is expected to lead to more frequent and more intense extreme rainfall events in the Netherlands. Studies suggest that 1 degree temperature increase would add 14% to the rainfall volume during extreme precipitation events. In Amsterdam, already now, intense rain showers often lead to flooding due to the limited permeability of the city’s surface areas. Getting rid of the water seems a first and obvious reaction. However, under a future climate, dry periods may occur more often during the summer months, requiring irrigation of urban vegetation in public and private spaces. Water should therefore be preserved within the urban environment. Also, temperatures will rise and the average temperature is expected to rise 1-1.3 degrees Celsius in 2050. This will be accompanied by more hot summer days and more frequent heat waves during which the built environment may become unpleasantly warm. The primary objective of the residents-to be for the Vrijburcht building block was to offer an attractive and sustainable building for people to live, work and meet by creating a mix of affordable housing, ateliers/offices and public space. The complex was primarily financed by the residents-to-be. All houses are reached via the courtyard that functions as a central and informal area for residents to meet. At the same time it should reduce the risk of pluvial flooding, store rainwater for irrigation and decrease heat stress by providing a good micro-climate to the users of the building. Rain water from the roof tops is collected in two tanks that are buried in the garden and can in total contain 6000 l of water. This water is used for irrigation of the garden and the plants on the surrounding terraces/balconies and covers the total irrigation needs in most of the years. The car parking garage is constructed under the building and the garden is paved minimally to create maximum permeability for rain water in the garden. Relief is created so that water flows from higher parts to a marsh-like environment. This prevents flooding of the garden and enhances vegetation diversity by creating dryer and wetter environments across the courtyard garden. Drainpipes are detached from the facades at ground-floor level and together form a pergola construction for creeping plants. This minimizes the impact of eventual leakages on the facade. Creeping plants are also used at the exterior of the building were they cover wind screens to form green facades. The many trees in the garden provide shade and thus contribute to an agreeable microclimate on hot summer days. To be able to realise the building complex and courtyard garden, a collective private commissioning (CPC) initiative was started allowing the future residents to organise themselves and realise their wishes (see also ‘Stakeholder participation’). The project is a collective private commissioning (CPC) initiative. This means that future residents jointly developed the project, including carrying the risks involved in the pre-financing. Future residents organized themselves in a foundation (Vrijburcht Foundation). This organisational set-up has the benefit that it gives much freedom to the future residents to realize their wish, but also asks for strong commitment to the process. All costs were carried by the Vrijburcht Foundation on behalf of the (future) residents. There was no subsidy involved. Instead Vrijburcht Foundation arranged with Rabobank the option of a personal loan at favourable interest rate and arranged procedures for a special mortgage construction of Amsterdam for people with an average regular income (the so-called ‘Amsterdamse Midden Hypotheek’). Also the (social) housing corporation ‘De Key’ provided financial warranty and know-how. Vrijburcht was initiated in 2000 by a group of people around the architect, all living in the centre of Amsterdam. They saw the possibility to create their own new housing in a CPC project. It was their vision that the building should include working spaces and a theatre function. This small group of people started to involve more people, and presented their plan to the municipality. The municipality of Amsterdam reserved specific areas of the newly constructed island ‘Steigereiland’ for the CPC project. In 2002 a parcel was definitively allocated to Vrijburcht. In the course of 2002 it became clear that there were not enough participants yet. At this stage the (social) housing corporation ‘De Key’ got involved and in 2003 De Key signed an agreement with Vrijburcht Foundation, which was legally established the same year. The agreement concerned back-up and support in the realization of the programme, and the financing of 21 homes, subsidised rental of housing for assisted living for six young people with a light impairment and their attendants (De Roef), and the purchase and lease of the day-care and café building. ‘De Key’ has been granted a passive general board membership in the Vrijburcht Foundation. The courtyard garden commission becomes active in 2004 and presents its plans in a workshop in June 2004, around the time of the completion of the preliminary design. The design of the courtyard garden was made by landscape architects who were also involved in Vrijburcht Foundation as residents-to-be. Their involvement in an early stage of the process made it possible to come to a real integration of garden and building (e.g. parking garage fully under the building and not under the garden, pergola construction of rainwater pipes) and a serious budget for the garden. Via presentations, excursions, an opinion poll and several workshops with other future residents a common idea about program, atmosphere and design style was formed. A separate ‘garden commission’, responsible for the maintenance of the garden, still exists. The building construction/development process was a collective process with the common wish for a building that was sustainable in both social and climate context. The concept of the green and sustainable courtyard was broadly supported by all stakeholders. 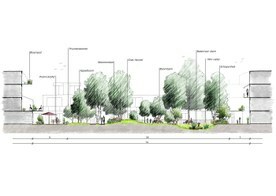 Early involvement of landscape architects in the collective process was a key element to integrate the green space with the building and to reserve enough money from the total project budget to realize it. The Vrijburcht Foundation consisted of people that invested a lot of time and effort in the process, which is a prerequisite in a collective and private commissioning. The landscape architects brought in their professional experience into the process management as members of the Vrijburcht Foundation. The (social) housing foundation ‘De Key’ provided financial warranty by financing the houses that were not yet sold, and by letting these out, and by letting out other spaces (e.g. day-care centre and housing for slightly disabled people). ‘De Key’ also provided experience in overseeing the construction phase. This enabled the start of the building at the stage in which there were not yet enough private participants. ‘De Key’ took part in the Vrijburcht Foundation but gave the private participants space to develop their own concept. Low-tech measures were taken which made the garden affordable and sustainable (e.g. use of common creeping plants instead of technical solutions for green facades). The costs of the garden itself were € 55.000, excluding the costs of the rainwater storage facility (€ 17.500) and a greenhouse (€ 30.000). The total costs of the building complex were € 16 million. The costs of the garden were carried by all residents/users as part of the total costs through the Vrijburcht Foundation (see also ‘Stakeholder participation’). The garden was a collective wish of the stakeholders and was financed by them by making compromises in the overall design of the complex: the overall budget was fixed but the garden could be financed by economizing on other aspects of the building design. On annual basis the costs for maintenance of the garden amount to € 3.000, including the contribution of a gardener next to the voluntary work of the residents. Also costs of the maintenance are carried by the inhabitants and ‘De Key’ as part of the regular service fees of the building, managed through the homeowner association. A garden commission takes care of the overall aspects of the maintenance of the collective garden. Benefits are difficult to express in monetary terms. The garden contributes to the well-being of the residents and a good micro-climate. Inhabitants for example do not feel the need for air conditioning in their houses. Water for irrigation of the many plants on terraces besides the courtyard garden comes from the rainwater storage facility which meets the water needs in most years. Flooding of the garden during intense showers is prevented. The garden is also a recreational place where residents meet, thus underlining the collective aspect of the complex, provides fruit/vegetables and serves as a natural playground for children. The development of the project was done through private collective commissioning. Private persons jointly acquired a piece of land and united themselves in a Foundation that acts as a commissioner for the whole project. This means that residents have influence on the project through the hoc created Vrijburcht Foundation. Once the project was realized, all owners of the apartments and other spaces in the building have been united in the Homeowner Association (Vereniging van Eigenaars), which is a legal entity that takes care of the maintenance of the building and other shared interests, among which the garden. The association has an executive committee, a general assembly, a chair and a financial committee and is a common structure in all cases in the Netherlands when more owners are involved within a building. Planning phase started in 2000, construction phase started in 2005. Vrijburcht, including the courtyard garden, was completed in 2007. For the building itself the time horizon for maintenance is 40 years but there are no fundamental limitations for a longer use. For the garden there is also no restriction, although yearly maintenance will be necessary. 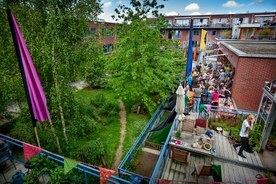 Vrijburcht - a privately funded climateproof collective garden in Amsterdam: websites and interviews to M. Vergunst and H. Schuitemaker.